Your Career - How Long Should You Stay At Your First Job? You've landed your first real job! 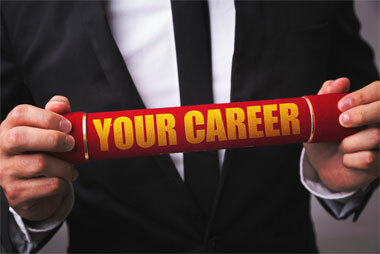 You've made it to the big leagues, and if feels as though you're building the foundation for the rest of your career. This is true, to some extent. First jobs are perfect for learning exactly what it means to be an employee. Not only will you learn about the company you're working for and your position in particular, you will have a chance to learn about office cultures and how to conduct yourself professionally. However, your first real job definitely doesn't need to be the same job you'll have for the rest of your life. It doesn't matter why you chose to take this particular position, there will be a time when you'll want to start thinking about planning your next move. Use the tips below to plan your future (career-wise, at least). Meeting the Benchmark. Many professional experts believe that one year is considered the minimum amount of time to stay in your first job. Consider this job an entry-level position, a paid opportunity to learn. In addition to learning how to do your job, you should also figure out how you can be more valuable to the company. After all, you never know when an opportunity for a promotion might make itself available. No one is going to give you more responsibility until you've proven that you can handle your smaller responsibilities. Also, don't expect to receive a promotion or a raise during your first year. Although it could happen, the last thing you want to feel is disappointment when (and if) it doesn't. By remaining a little more realistic in your expectations, you'll be more open to learning and growing. Look for Opportunities. If you see that there's an opportunity to grow, or you're really enjoying your current position, feel free to stay after a year has passed. If you find yourself in a collaborative, open environment that encourages growth for instance, or if you're lucky enough to have found a mentor, it makes all the sense in the world to stay. The Exception to the Rule. There's always an exception to every rule, including the one-year job recommendation. If you decide to take a job that's at a significantly lower level than your qualifications and experience indicate, leave if you get an offer for a position that's more in line with what you're looking for, even if you haven't been in your current position for very long. In this chaotic job world, many people choose (or feel forced) to accept junior-level jobs despite their qualifications and experience that would otherwise merit more senior positions. If and when this occurs, all bets are off, and there is no one-year grace period necessary before moving on to other opportunities. An additional reason to leave prior to hitting that one-year mark would be an abusive work situation, including any type of harassment. Other reasons include a bad fit, such as the possibility that you have simply landed in an environment that doesn't match your personality. If you do find yourself in a position where you quit prior to a year, think about what happened so you can prevent it from happening again in the future. Before taking a new job, take the time to complete your due diligence and get to know the company and the position so you know exactly what you're getting yourself into. If you do leave before a year is up, it's imperative that you stay at your next position for longer than a year. Leaving your second job too quickly can establish a pattern of job-hopping, which will raise a red flag with many employers. Staying at your first job for one year is the norm, but you need to decide what is right for you and the career path you have envisioned. Learn, grow, and move on.